Canna Hydro Vega is recommended for those systems in which the water drains away from the system as opposed to returning to the nutrient tank (aka Open Hydroponic/Run-to-Waste systems). 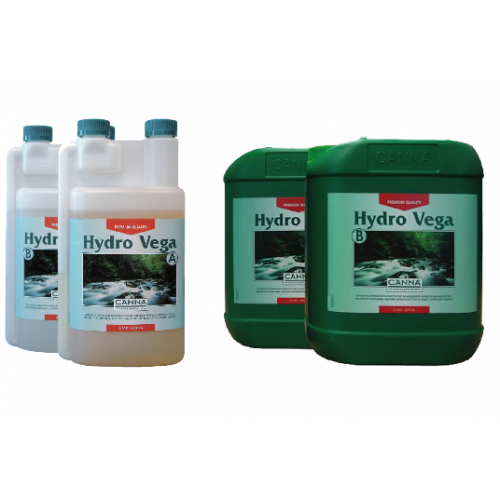 Hydro Vega is comprised of all of the essential nutritional elements necessary for healthy growth during every cycle of plant development. Since run to waste systems are mainly inert, in that they don’t take from or add to the nutrient solution or the substrate itself), the nutrients must obviously come from the nutrient solution itself. However, an overabundance of the product can be damaging to both the plants and the environment. This is why Canna Hydro Vega is available in both a hard water and soft water form. Be sure to purchase the correct method for your growth medium. Mix equal parts A &B Canna Hydro Vega 15 minutes apart. Never mix the 2 parts while in concentrated form.